Dedicated to a friend of mine, Roseanne, who loves beer. Various kinds of beer are sold in the supermarket. 500ml cans and 300ml bottles are the main containers. It is difficult to find 350ml can like Japan. In Norway, beer is so expensive, and its price is 400 Yen. But, in the next country, Sweden, the price is from 70 yen to 100 yen a can. 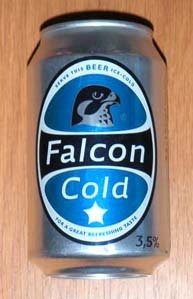 Of course, I buy beer in Sweden. Here, I will introduce some. 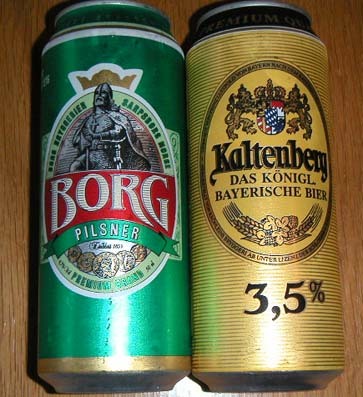 The left one, BORG is often sold in the supermarket in Halden. It might be local beer. Alcoholicity of beer is mainly 2.8%, some are 3.5%. In addition, there is a small can! 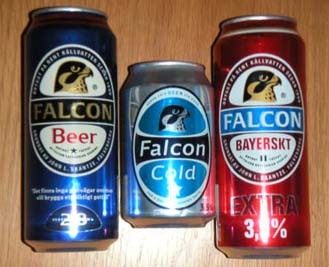 Three brothers of FALCON beer! It's scary (laugh).